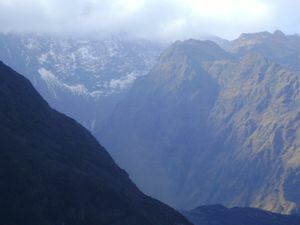 Quime is a small city in Yungas of Inquisivi region of La Paz. About mid way between Cochabamba, Oruro and La Paz, Quime is in a deep forested valley surrounded by high peaks of the Andes. The region is one of the steepest in the Bolivian Andes and the center of biodiversity of both Andean Bolivia and South America. Resident foreigners and Bolivians call it "Heaven´s Warehouse" of Bolivia. The population is 10,000, with 3,000 living in the town and the rest in 31 indigenous Aimara communities scattered over an area the size of Luxembourg. Quime is the center for hiking and exploration of the Cordillera de Quimsa Cruz. Traditionally, it has been an area with little tourism of any kind and perfect for adventure hiking in an untouched area of Bolivia. Though you won't find much about Quime in any tour guide books, the area has become an increasingly popular "word-of-mouth" area for travelers between La Paz and points south. The temperature lows are seldom, if ever, below 6 C: (40 F.) and highs seldom, if ever, over 26 C. (80 F.). Basic services include: hospital, cell phone service, call centers, and three small radio stations. There are no money machines (ATMs) but internet has recently been connected. The people, mostly miners and indigenous campesinos, are friendly to travelers. Communarios love to teach guests a few words of Aimara and miners will show you around their mining operations. Quime is presently working on setting up small native huts as guest houses in nearby villages, and a self guided nature walk near the Naranjani Falls and Lake. Quime Valley in the canyon below as seen from the road to Quime. The easiest and fastest way to get into Quime is by taking any bus whatsoever from La Paz, 2 hours, Bs 20-25, towards Oruro or Cochabamba to a place called Conani (located about 95 km from Oruro towards La Paz, there is a toll booth), There you can catch a bus, a minibus, a taxi or an open air truck to Quime (about 1 1/2 hours). Minibuses are now leaving from Conani about once every hour until about 8 PM. Please note that the ones on the main highway originate in Conani and they might try to charge you Bs 150-250 and take you privately. The Quime taxis and minibuses are alongside the Quime road and they charge Bs 25 but you must wait for them to fill up. They have just put up a sign on the restaurant from whence they leave. It is best to get to Conani before 3 PM which means leaving La Paz before 12:30 PM. There are two alojamientos (new, private rooms reported as Bs 20 per night)and restaurants in Conani. It is less than an hour from Oruro with a constant flow of buses. If using one of the La Paz-Quime buses: It is best to make your bus reservation the day before to get good seats, you may make reservations by phone. The first 2 in the following phone numbers is an area code and may not be necessary depending on where you call from. Typically Bolivia-style confusing. 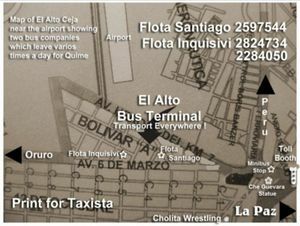 From La Paz: Flota Inquisivi has one bus a day from the main La Paz bus terminal. Their Office #38 is towards the back of the terminal. The bus leaves at 6AM Daily. Call 2228-4050 for reservations. From El Alto: Flota Inquisivi has a daily bus leaving from the El Alto bus terminal at NOON. Their office is located on Calle Téllez Ross between Marcelo Quiroga Santa Cruz (ex Calle 2) and Calle Luis Espinal (ex Calle 3. Call 2282-4734 for reservations. From El Alto: Flota Apostal Santiago has four to five buses daily from El Alto. Buses leave at 6 AM, 11 AM and 12:30 PM daily as well as betwen 4 and 6 PM. Their office is near the Ceja of El Alto around the corner from the BCP Bank on "Calle 2". Phone 225-97544. From Cochabamba, Oruro, Potosi, Uyuni etc. Take any bus towards La Paz. About 60 km towards La Paz from Caracollo which is the junction La Paz/Cochabamba/Oruro about 30 mins from Oruro, 4 hours from Cochabamba)is a toll booth at a place called Conani. This is on the La Paz/oruro road 2 hours from La Paz. You get off at Conani (tell the bus driver CONANI)and wait for any of the buses from La Paz. There are also minibuses, taxis and trucks. From Conani its about 2 hours to Quime. Thereis food and lodging in Conani. It is best to arrive in Conani before about 2 PM if you can. Walk a half block down the Prado from the corner of Sagarnaga and the San Francisco Church. There are no less than 14 minibuses (about 2-3 a minute) going to the Ceja. They also say "Ceja" and cost $.35 cents US. In 5 minutes I saw the following minibus lines to la Ceja: 311, 934, 222, 240, 908, 256, 940, 919, 859, 289, 807, 837, 219 and micro 13. It takes 19 minutes to get to the ceja and you get off at the turn-off for Ave. Juan Pablo II. From this corner follow the main boulevard, called 6 de Marzo south about 7 minutes walk until you get to the corner with a BCP bank and a PRODEM bank. Turn right towards airport and walk about 50 meters and on the left hand side is the Apostal Santiago bus office at address no.62. To get to the Flota Inquisivi office, pass the BCP bank instead of turning right and continue down the main boulevard two blocks to Calle Marcelo Quiroga Santa Cruz. You will see a PERNOS JHASEN hardware outlet on the corner. Turn right towards airport, walk 25 meters, turn left, walk 40 meters and the office is on the left hand side of the street next to address no. 2480. The bus trip is about 4-5 hours and costs $3.00. The bus passes down through the high Andes above Quime.They are steep, often covered with some snow, and perhaps the most spectacular in Bolivia. The road is wide, safe and well graded. While the rest of Bolivia may have strikes and road blockades, such as the one that has recently closed down Rurrenbaque for 12 days, Quime is nearly almost open, without blockades and strikes. Quime transportistas know alternative routes to bypass blockades even on the main road between La Paz and Oruro. Be sure to bring heavy clothes if you plan a truck as the road goes over a 16,000+ ft pass. From Quime bike to the river below Inquisivi which is a hot, dry subtropical area. You then catch a bus back to Quime. Motorcycle tours through Quime and then through the Yungas originate in Cochabamba. Quime's a pretty small place, with everything within a short walking distance. However if going up the hill it might be useful to take a taxi. If not, it's great exercise, especially at 3000 m. altitude. You can find the radio taxis on the Alameda by the Flota Inquisivi bus station a block from the central plaza.The taxi stands are at the Alameda near the coffee kiosks. There are numerous local trucks and buses that leave for just about everywhere in the province from the Alameda. Mostly you get around on foot for the numerous day hikes, or use mules for expeditions and treks. Visitors are catching the 6:00 AM truck to visit the high altitude mine at Chambillaya, a rather primitive and highly spectacular operation. 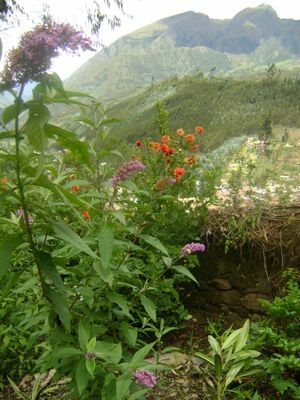 They walk an hour down the mountain to return to the Hostal Colibri. The name Quime comes from the Quechua word for "Place to Rest" and was a traditional stopping point for mules carrying coca and gold out, and food supplies in. One old resident remembers his grandfather bringing a grand piano in pieces via mule train. For the past 100 years it has been a commercial center for the numerous tin, zinc, wolfram, silver and gold mines which often cling to sheer cliffs. The Quime area is for people who either want to take a break and sit around on a mountainside without other tourists around or have pìcnics in native elfin forest and rest up AND/OR for hikers, adventurers and trekkers who want to do something no one else has ever done before. See a review by experienced hikers at . The views, looking over 50 miles of Andean mountains and valleys, are spectacular from the upper edge of town or the surrounding mountainsides. Nearby are Elfin Cloud Forests laden with mosses, lichens, ferns and bromeliads. A number of rare birds inhabit the area, including the endemic Rufous-breasted Grosbeak. The reclusive and endangered Spectacled Bear lives in a refuge nearby but is seldom seen. Some visitors have recently photographed a herd of dwarf Andean deer neasr Naranjani Lake. Professional ornithologists and botanists continue to discover new bird and plant species in the area. It may be difficult to get a good map of Quime area in advance. Instituto Militar in La Paz has a decent map in sheets, but Quime is in the corner of a sheet what makes you have 4 sheets to cover the area. 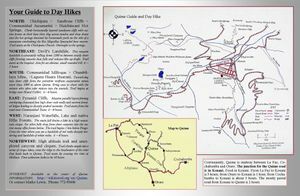 Better choice may be to ask locals in Quime, where to go and how - they can give you some map as well. The most popular day hike is to the primitive tungsten mine, Chambillaya. It is not a tour and here is how it works: At 5:30 AM the visitor catches the mining truck for a dollar to the mine. You will be riding (~1 h) with the miners and it is highly suggested that you bring a half pound of coca leaf to share with them. About an hour up the mountain you get to the abandoned Chambillaya mining town, now in ruins but with some pretty interesting artifacts laying about. The mine is another thousand feet up the mountain. If you make friends with the miners, actually quite easy sharing coca, they may take you on a tour of the mine. Santos, a miner who lives on the field next to the Hostal Colibri on Calle Barrientos, can often be convinced to rent boots, hard hat and lantern for Bs 50 and take you to the area they are working deep within the mine - you may spend all the day (if you are up to) inside seeing and helping with the operations (including dynamite and perforating). Thew miners have been very friendly about showing off their work. Some tourists have continued up to one of the nearby summits to watch condors. From the mine its an easy hour or so hike back to the hostal. Day hikes include the Naranjani Waterfall and the Naranjani glacial lake, local wolfram mines, Chambillaya Ghost Town below the mine, or the Devil's Slide. The Naranjani Waterfall is actually 7 waterfalls falling about 2000 feet from a cirque lake down into the forest near Quime. The area has been proposed as a municipal nature reserve and self-guided nature hike (volunteers welcome). It is a 3 hour walk from Quime up and an hour down. The central fall which drains a cirque lake dries up in the dry season, but other smaller falls are suitable for bathing. From Quime, one can see the "Devil´s Slide". This is a 1000 m high landslide constantly producing plumes of dust reminescent of an active volcano. The Devil´s Slide is about 2-3 hours walk. Two-day hikes include the Huichincani Hot Springs. This is unique in that it has never been developed except by campesinos making rings of rocks around pools. The springs are on a steep mountain slope over looking the Miguillas River Valley and ringed by a cirque above. Also one can visit the Sacambaya Castle, a pre-inca castle in the immediate area where the Jesuits buried their gold after their expulsion from South America. According to archives, slaves built caves to hide the gold, then were buried alive with the gold under massive landslides. Major expeditions dating back as much as a century have falled to find the Lost Jesuit Gold of Sacambaya. The owner of the Hummingbird Ranch - Hostal Colibri has a collection of maps and thirty years of experience in the area and will help arrange day hikes and much longer treks, including trips to the newly discovered Enchanted City of Choquercamiri, and still only partially discovered pre-inca Cotas culture ruins which are reminiscent of Macchu Picchu, but little known and unrestored. He draws nice maps from memory by hand as well. The Santiago Fiesta starts July 23 and lasts a week. This is a week of 1000's of Quime families dancing in indigenous costumes, making social contact, free drinking (until you drop) the local "coktels" and eating native food including huatias. Hotel reservations should be a week or two in advance. Indigenous community loctayas. The entire month of August and early September indigenous comunities around Quime have their annual rituales giving thanks to Pachamama, making huatias (earth cooked food), sacrificing llamas and dancing. The "whole world" is welcome to take part. Guests pin some bolivianos, as is customary, to the shirt of the person who is sponsering the rituals and bring some coca to share. Pumuta Indigenous Community Ecological Park. This Aimara community is developing an ecological park in remnent cloud forest about one hour of a walk from Quime. Visitors may be interested in helping with the location and development. Along the way is picnicking in the canyon of Rio Chichipata about 45 minutes a walk away. No discoteques or bars, but you can drink freely with locals at their parties (marriages, baptisms, school graduations or any other excuse) usually on most Fridays and Saturdays. The oldmule trail (The Coca Trail) has been rehabilitated as a single track biking trail used in international competiton. 30 km long. Spectacular drops from the Cumbre de Tres Cruces at 5400 m. altitude direct to Quime at 3000 m. Have the bus drop you at the Cumbre de Tres Cruces. This is not only spectacular but can be truly dangerous, unlike the so-called "Death Road" which is about as deadly as Granma' s rose garden. Along the way stop for lunch at a mine about half way down which is built about 1000 feet up on a sheer cliff with ladders etc. Those on a low budget or hate shopping will love Quime since there is nothing much to buy unless you are interested in hand woven blankets and native costumes made by and for local people, or locally made aloe veroe shampoo. You can buy lots of food to cook (in a distance of a block or two around the center), as well as fruit and vegetables, especially at the local Sunday Fair. Meat and cheese are not in fridge, but fresh. You can also get basic household things and pretty much outfit a minimilist rough-it expedition. Hostal Colibri offers use of kitchen. The kitchen is large, clean and fully equipped. The hostal also offers breakfast, lunch and dinner if requested 24 hours in advance. Quime's famous specialty is the huatia. This is meat in a mild chili sauce, cooking bananas, sweet potatoes, horse beans, sweet corn and potatoes buried in red hot rocks covered with earth and tree tobacco leaves then baked underground for an hour or so. There are numerous "eat at your own risk" restaurants in the Alameda where the local buses stop for lunch. The soups are safe. The only restaurant that Quime resident Jhon recommends is the one on the corner accross the street from the Apostal Santiago Bus office. At the Sunday fair there are local dishes like Picante de Pollo, Fricase, Sajta de Pollo for about $3.00 a plate. You´ll have to drink like the local Aimara people, that would be either beer or another Quime specialty.... the coktél. The coktél is made of 180 proof cane alcohol (perfectly safe and rather hallucigenic)mixed with fruit juices (orange, passion fruit, lemon/lime and/or herbs like coca, mint, lemon mint and/or chamomile. These are served hot or cold. Whatever you do, don´t try the coktéls made out of kool-aid and cane alcohol they sometime serve at the almost constant weekend parties. Cane alcohol coktéls made with fruit juice are strong. The Alojamiento Santiago is almost directly opposite of the Santiago Bus Office on no. 342 Calle Bolivar two blocks from the plaza. No sign but just knock on the door or ask help from the Infotour office on the same street. They can contact the owner for you. This is also a private house. It has three rooms with 7 beds each on a balcony overlooking an interior patio and garden. The owner will try and assure you that you have a private room. It costs $5.00 a night. Phone 76536725 The owner can make up a sauna for which he charges $7.00 for a group sauna. The Hotel Quime is near the plaza. It is basic, with occasional hot water. It has a restaurant and a garage. the garden in front is pretty, but the facade needs paint. Prices are not listed and apparently change depending on unknown criteria, but are apparently somewhere between $5-7 per person. The mayors office has just opened an internet cafe on the main plaza with 30 computers running at 512. Cell phone services are by TIGO and ENTEL with boothes in the center. Take one of about 6 or more daily buses leaving Quime to La Paz, or get off in Conani (two hours away) and catch a bus at the toll booth to any other destination in Bolivia including Oruro, Potosi, Cochabamba or Santa Cruz. Since June, 2012 there is a constant flow of minivans to Conani where one can easily catch transportaion to anywhere in Bolivia. 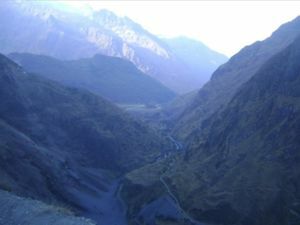 For the more adventurous....it is possible to head to La Paz, via Chulumani, through the interior valley. Minibuses and flotas leave for this road daily, around 1pm. Adventurous travellers have also successfully hitchiked on coca trucks along this route. This page was last edited on 25 January 2019, at 10:15.